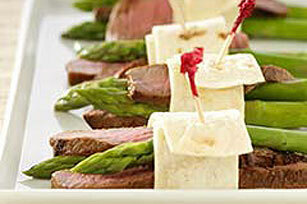 Whether you serve them as an appetizer or side dish, these Steak & Asparagus Wraps are bound to make an impression. Pour marinade over steak in resealable plastic bag. Seal bag; turn to evenly coat steak with dressing. Refrigerate at least 30 min. to marinate. Meanwhile, preheat grill to medium heat. Remove steak from marinade; discard bag and marinade. Grill steak 13 to 16 min. or until medium doneness (160°F), turning occasionally. Meanwhile, steam asparagus 8 to 10 min. or until crisp-tender. Cut steak into thin strips. Place 1 to 2 steak strips and about 2 asparagus spears on each tortilla strip; roll up. Secure with frilled toothpicks or red bell pepper ties, if desired. Serve warm. Serve wraps with A.1. Steak Sauce. Cut large red bell peppers into long thin strips; place in a bowl of ice water. Let stand several hours or until peppers are slightly curled. Drain peppers, then use to tie around the asparagus wraps. 2-1/2 doz. or 30 servings, one wrap each.